Windows Tutorials, Howtos, and More! 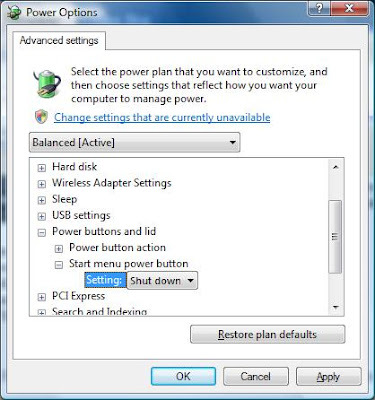 : How to change the power button in Vista to shut down your PC. How to change the power button in Vista to shut down your PC. If you do not like to put your computer to sleep or would just rather have the power button in the Vista Start Menu shut down your computer you can follow this simple guide. Click Read more to see how! 2. In the search box, write "Power Options" and open it. 3. Under the selected power plan, click "Change plan settings"
4. Click "Change advanced power settings"
5. Open "Power buttons and lid" and then "Start menu power button"
The button in the Start Menu should now look different and shut down your computer! You may close out of the Power Options window if it is still open.